A sepoy (/ˈsiːpɔɪ/) was originally the designation given to an Indian infantryman armed with a musket in the armies of the Mughal empire. The term "sepoy" is still used in the modern Nepalese Army, Indian Army and Pakistan Army, where it is used for the rank of private soldier. The term sepoy is derived from the Persian word sepāhī (سپاهی) meaning "infantry soldier" in the Mughal Empire. In the Ottoman Empire the term sipahi was used to refer to cavalry troopers. In its most common application, sepoy was the term used in the British Indian Army, and earlier in that of the British East India Company, for an infantry private (a cavalry trooper was a sowar). The term sepoy came into use in the forces of the British East India Company in the eighteenth century, where it was one of many, such as peons, gentoos, mestees and topasses used for various categories of native soldier. Initially it referred to Hindu or Muslim soldiers without regular uniform or discipline. It later generically referred to all native soldiers in the service of the European powers in India. Close to ninety-six percent of the British East India Company's army of 300,000 men were native to India and these sepoys played a crucial role in securing the subcontinent for the company. A Mughal sepoy, under the command of Mirza Najaf Khan. The Mughal Emperor Aurangzeb leads his final expedition (1705), (sepoys column visible in the lower right). A Sipahi or a sepoy was an infantryman in both the Mughal Empire and the Kingdom of Mysore. The Mughal Emperor Aurangzeb (reigned 1658–1707) raised battalions of sepoys variously armed with matchlocks, rockets, and grenades. These troops were successfully employed in siege warfare, particularly during the Siege of Bidar, the Siege of Bijapur and the Siege of Golconda. 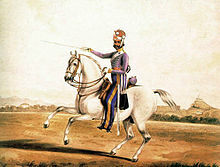 A painting showing a sowar (cavalry equivalent of sepoy), 6th Madras Light Cavalry of British India. Circa 1845. The East India Company initially recruited sepoys from the local communities in the Madras and Bombay Presidencies. The emphasis here favored tall and soldierly recruits, broadly defined as being "of a proper caste and of sufficient size". In the Bengal Army however, recruitment was only amongst high caste Brahmin and Rajput communities, mainly from the present day Uttar Pradesh and Bihar regions. Recruitment was undertaken locally by battalions or regiments often from the same community, village and even family. The commanding officer of a battalion became a form of substitute for the village chief or gaon bura. He was the mai-baap or the "father and mother" of the sepoys making up the paltan (from "platoon"). There were many family and community ties amongst the troops and numerous instances where family members enlisted in the same battalion or regiment. The izzat ("honour") of the unit was represented by the regimental colours; the new sepoy having to swear an oath in front of them on enlistment. These colours were stored in honour in the quarter guard and frequently paraded before the men. They formed a rallying point in battle. The oath of fealty by the sepoy was given to the East India Company and included a pledge of faithfulness to the salt that one has eaten. The salary of the sepoys employed by the East India Company, while not substantially greater than that paid by the rulers of Indian states, was usually paid regularly. Advances could be given and family allotments from pay due were permitted when the troops served abroad. There was a commisariat and regular rations were provided. Weapons, clothing and ammunition were provided centrally, in contrast to the soldiers of local kings whose pay was often in arrears. In addition local rulers usually expected their sepoys to arm themselves and to sustain themselves through plunder. This combination of factors led to the development of a sense of shared honour and ethos amongst the well drilled and disciplined Indian soldiery who formed the key to the success of European feats of arms in India and abroad. Following the Indian Rebellion of 1857 the surviving East India Company regiments were merged into a new Indian Army under the direct control of the British Crown. The designation of "sepoy" was retained for Indian soldiers below the rank of lance naik, except in cavalry where the equivalent ranks were sowar or "trooper". It is to the military genius of the French that we are indebted for the formation of the Indian army. Our warlike neighbours were the first to introduce into India the system of drilling native troops and converting them into a regularly disciplined force. Their example was copied by us, and the result is what we now behold. Sepoys were also recruited in Portuguese India. The term cipaio (sepoy) was also applied by the Portuguese to African soldiers in Angola, Mozambique and Portuguese Guinea, plus African rural police officers. Cipaios from Angola provided part of the garrison of Goa during the final years of Portuguese rule of that Indian territory. The same Persian word reached English via another route in the forms of sipahi and spahi. Zipaio, the Basque version of the word, is used by leftist Basque nationalists as an insult for members of the Basque Police, implying that they are not a national police but servants of a foreign occupier. In Hispanic American countries, especially in Argentina, the word cipayo has historically been used as a pejorative colloquial expression referring to individuals considered as serving foreign interests, especially those of the United States or Britain. Jawan, the word used today to describe a soldier of the armies of India and Pakistan. Sowar, meaning "the one who rides" in Persian, was originally a rank during the Mughal period. 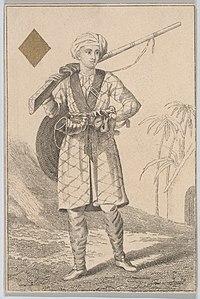 Wikimedia Commons has media related to Sepoys. ^ Gerald Bryant (1978). "Officers of the East India Company's army in the days of Clive and Hastings". The Journal of Imperial and Commonwealth History. 6 (3): 203–27. doi:10.1080/03086537808582508. ^ a b c d e Mason, Philip (1974). A Matter of Honour. London: Holt, Rhinehart & Winston. ISBN 0-03-012911-7. ^ "India's Sepoy Mutiny". Fsmitha.com. Retrieved 1 August 2012. ^ Mason, Philip. A Matter of Honour - An Account of the Indian Army, its Officers and Men. p. 125. ISBN 0-333-41837-9. ^ La AN condena a dos años de cárcel al autor de los destrozos en el "bosque de Oma"[permanent dead link], Deia, 12 January 2005. Quoting a sentence from the Audiencia Nacional: «siendo público y notorio que el término "zipaio" es el que se da a los miembros de la Policía» vasca.